Where are the areas of herbivore depletion and excessive algae and how can we identify priority hotspots for herbivore management to recover coral reefs? The objective of this project is to identify areas where herbivore management interventions would be the most effective in promoting coral reef recovery and resiliency following the recent coral bleaching. 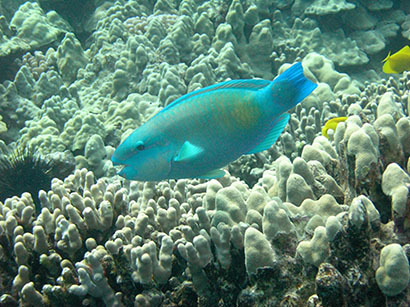 When a bleaching event occurs, as Hawai‘i experienced in 2014 and 2015, the results can be regime shifts or reef decline (permanent or temporary). There is an urgent need to develop a process to increase the resiliency of Hawai‘i’s coral reefs. Herbivory maintains open spaces, promotes remnant corals to recover, and allows new coral to settle in disturbed areas. This project will operationalize this concept by 1) synthesizing climate and herbivore management spatial data layers, 2) utilize Marxan to identify prioritized areas for herbivore management 3) integrate Marxan outputs into SeaSketch, and 4) engage stakeholders in two priority areas, West Hawai’i and Maui to refine the Marxan output. This assessment will identify areas where herbivore management would have the greatest impact to promote coral recovery and resilience. These results will feed directly into Division of Aquatic Resources (DAR) rulemaking to promote recovery & will be an international model for a process to support resilience-based management.